Camp Bisco 9, the three-day Upstate music fest put on by Disco Biscuits in its ninth year, will be happening July 15th-17th in Mariaville, NY, about 3 hours north of NYC. It’s set to have two main stages, a DJ tent and a late night dance tent, and the initial lineup includes LCD Soundsystem, Ween, Girl Talk, Major Lazer, Diplo, Thievery Corporation, Gift of Gab and more. All of the currently announced acts are below. Ween‘s next NYC-area show is in NJ on May 20th. Still waiting for the next LCD Soundystem NYC show announcement. Meanwhile they’ve already announced Coachella, Bonnaroo and other dates (along with a new album). 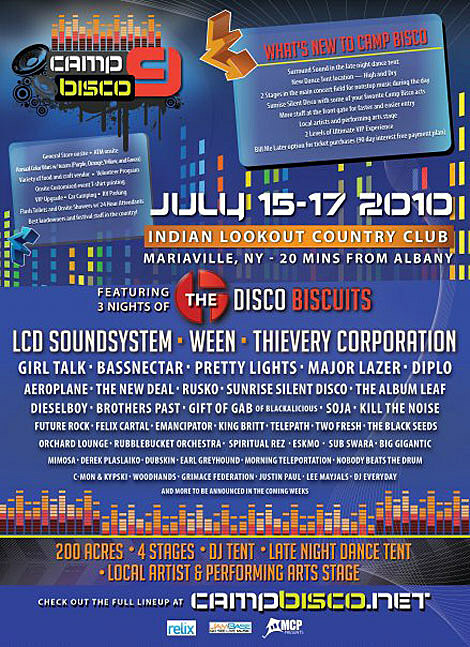 The Disco Biscuits have confirmed the first round of performers slated for Camp Bisco 9, the ninth annual three-day music and arts festival in Mariaville, New York this July 15-17, 2010. The 50+ performer lineup at the multi-stage camping festival includes: The Disco Biscuits – All 3 Nights; LCD Soundsystem; Ween; Thievery Corporation; Girl Talk; Bassnectar; Pretty Lights; Major Lazer; The New Deal; Diplo; Aeroplane; Rusko; Sunrise Silent Disco; The Album Leaf; Brothers Past; Dieselboy; Gift of Gab (of Blackalicious); Future Rock; SOJA; Telepath; Felix Cartal; Two Fresh; Kill the Noise; Eskmo; Orchard Lounge; Rubblebucket Orchestra; Emancipator; Spiritual Rez; Sub Swara; Derek Plaslaiko; Big Gigantic; Earl Greyhound; The Black Seeds; Grimace Federation; C-mon & Kypski; Nobody Beats the Drum; King Britt; Dubskin; Woodhands; Justin Paul; Lee Maytals and DJ Everyday. More artists and festival details will be announced in the coming weeks. Camp Bisco 9 will once again be held at the picturesque Indian Lookout Country Club in Mariaville, New York. The expanded setup will include: a second stage in the main field, an improved location for the DJ and late night dance tent – complete with a surround sound system, a local artists and performance art stage. Indian Lookout Country Club is located approximately 20 minutes travel time from Albany, New York, and sits on 200 acres of rolling, grass fields. The grounds come equipped with full bathrooms; which include flush toilets and showers, as well as 24/7 bathroom attendants. Festival goers will have access to a full bar on site and a general store, which sells almost every necessity for a comfortable and care free experience. Early bird tickets are on sale now for a limited time only and begin at $135. 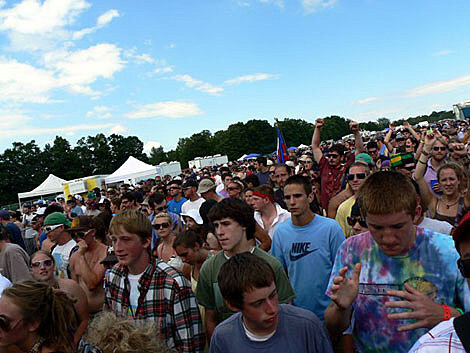 Tickets are available online at www.campbisco.net and 1-800-594-TIXX, as well as at all FYE stores in New England and select outlets in New York state. There will be two levels of VIP packages this year. Level One, the VIP Experience, will be made available for $199 in addition to the 3-day festival pass and Level Two is a Platinum Experience, available for $349 in addition to the 3-day festival pass. 50 cents of every ticket sold will be donated to Headcount, a non-partisan, not-for-profit organization devoted to voter registration and participation in democracy. Camp Bisco 9 is promoted by MCP Presents and hosted by The Disco Biscuits, who’s upcoming release, Planet Anthem, will be out on Diamond Riggs Records March 16th. Visit www.campbisco.net for the most up to date information.